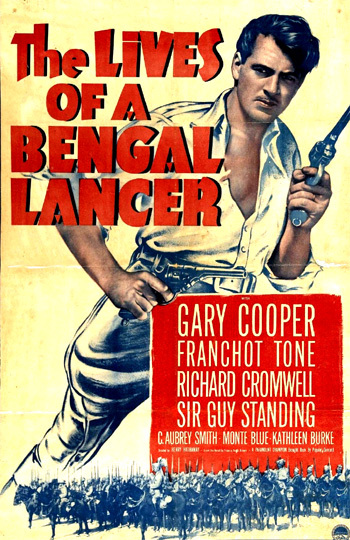 The Lives of a Bengal Lancer (1935) is a sweeping, escapist adventure tale of three British officers of the 41st Regiment of the Bengal Lancers, stationed in northwest India. The Paramount Pictures film was loosely adapted ("suggested") from the 1930 novel of the same name written by Major Francis Yates-Brown. The Lancers were historically prominent as defenders of India's NW frontier, notably the area of the Khyber Pass, inhabited by rebellious tribesmen. This film represented one of the best examples of the many films made about Indian military adventures, although it retained its paternalistic, pro-colonial attitude typical of the time period. Director Henry Hathaway and Ernest B. Schoedsack shot the background footage on location in British India starting in 1930, which was then cleverly interwoven into the Hollywood production. It was one of actor Gary Cooper's earlier films and helped to make him a star. Franchot Tone was starring in two of the biggest films of 1935, this film and Best Picture-winning Mutiny on the Bounty (1935) for which he was nominated as Best Actor. It received eight Academy Award nominations (with one win, for its uncredited Assistant Directors Paul Wing and Clem Beauchamp, who directed the action sequences). The category of Assistant Director was discontinued after 1937! The other nominations were for Best Director (Henry Hathaway, his sole career nomination), Best Picture, Best Screenplay, Best Film Editing, Best Sound Recording, and Best Art Direction. The film opens in Army Headquarters in India, where it was stated that the British were protecting 300 million people along India's troubled northern boundary, notably the Bengal Lancers. They are concerned about the treacherous and villainous "clever dog" chieftain named Mohammed Khan. On the border, impulsive and insubordinate Scotch-Canadian, Lt. Alan McGregor (Gary Cooper) orders counter-fire from machine guns to retaliate against sniping enemy Afridi fire, after the fall of his commanding officer Col. Hendrickson and other soldiers. He deliberately disobeys the orders of Colonel Stone (Sir Guy Standing) and Major Hamilton (C. Aubrey Smith), interpreting Stone's commands as stubborn and stiff (and afterwards calling him a martinet and a "ramrod"). His actions rout the attackers, although he is reprimanded by the displeased Colonel. In his office, Colonel Stone tells his son directly: "Don't try to take advantage. Don't expect any favoritism...You've got to start from the bottom. Learn everything, and if you don't measure up, out." McGregor realizes the young lad has been miffed by his father and could become bitter, stating that: "the old man has ice-water in his veins" and he soon takes him under his wing as his ward. Stone also addresses McGregor, warning him about expressing either sentimentality or impertinence in the Army. After the disappearance of Lt. Barrett (Colin Tapley), who was on a spy mission to gather information about a suspected mission of the ambitious Khan to overthrow the British by acquiring 2 million rounds of ammunition and providing it to local tribal rebels ("enough to start a small-sized war"), McGregor is assigned to discover his whereabouts. He is commanded to cross the frontier's border, with one NCO and 10 men, and supplies (including ammunition) - ostensibly it will be a hunting expedition. He chooses Forsythe to accompany him, to Stone's dismay - who then questions his cold-blooded father about his service (and later goes on a drinking binge). During the expedition, McGregor locates Barrett (disguised as a sword-wielding Muslim warrior) and learns that Khan is stirring up all the border tribes and "effecting a coalition of all the tribes." McGregor reports back to Lt. Stone, describing Khan's nefarious warring activities among the mountainous border tribes. He is promising to supply them with 2 million rounds of ammunition. Coincidentally and slightly suspiciously, 2 million rounds of ammunition are being delivered by convoy to their supposed British ally, the Emir of Gopal named Othman Ali Bahadur (Akim Tamiroff), with Khan plotting to steal the goods during their transportation. McGregor suggests commencing hostilities immediately (without orders and "without reporting this to the intelligence"). Overhearing McGregor's urging to fight back, Major General Sir Thomas Woodley (Lumsden Hare) - the chief of Intelligence - seconds the idea, takes credit and orders: "Col Stone, your regiment will leave at dawn for Gopal." The regiment of Bengal Lancers leaves early the next morning, with hung-over young Stone joining Forsythe and McGregor (and Col. Stone), on a mission to Gopal to investigate the Emir, although they claim that they are only journeying for the sport of pig hunting (or pig-sticking). The group of officers are lavishly entertained in the Emir's palace by Indian dancers, where Col. Stone is introduced by the friendly rajah to evil chieftain Mohammed Khan (Douglas Dumbrille). After being slipped an enticing note by Tania (Kathleen Burke), Khan's mistress (named Madame Volkanskaya), Stone sneaks away after the pig-hunt - against orders - to meet her. The duplicitous woman is actually a beautiful Russian spy (that Stone had met earlier on the train to the frontier), who aids Khan in kidnapping and capturing Lt. Stone. I am not going to do precisely what Mohammed Khan has planned that I should do. He took my son to goad me into pursuing him to draw the lancers from their position. He's mistaken his man...In our present position, the regiment holds Mohammed Khan checkmate. The regiment stays here...I cannot weaken the strength of the regiment in this emergency. And I can't permit you or any other officer to risk their lives for Mr. Stone. Well, gentlemen. We have ways to make men talk. When the officers refuse to cooperate, he proposes imprisonment and torture: "I regret this, but thanks to your colonel's cold heart and cold brain, I have no other choice, and very little time." He labels his own torture methods as "absurd and unpleasant extremes." His favorite and most effective method of torture is to drive bamboo slivers beneath their finger-nails and light them. McGregor is tortured first, then Forsythe, but both withstand the pain and neither reveals the ammunition route. Then after they are both thrown into a dungeon, Donald rapidly breaks down, screams and talks, further showing resentment toward his cold-hearted father. The prisoners' cure for boredom is by betting millions of non-existent rupees on cockroach races (the bugs are given the names of their enemies) within their dungeon cell. I told them, and why shouldn't I? For him? To stand there and watch and know all the time I was gonna be next to have your nails torn off and those pincers and burning sticks driven into you until - And things you can't even talk about. Why should I stand all that? For what? For him? For a service that makes him like he's been to me? He left me here, didn't he? He knew what they'd do. He wouldn't come after me, not him. Regiment, service, duty! Why should I stand what you did for them? Why should I? Why should any of us? Why? McGregor slaps Stone across the face: "I told you to forget it," and then explains his sense of stiff upper-lip British duty to loyally serve, echoing advice he had heard earlier from Major Hamilton: "There are some things they don't teach you in military college. Can't, I guess. India's big, you know. There are 300 million people and run by, uh, just a handful of men. The job comes first. Like old Ramrod, you can't let death move you, nor love. And it's like - how can I tell you what it's all about when I don't know myself." Machine guns and 2 million rounds of ammunition are seized and brought back to the Khan's fortress. Khan prepares himself for a deadly counter-attack, boasting that the Colonel's Bengal Lancers, an attacking force of 300 gathering outside the gates of his stronghold at Mogala, will be annihilated. Colonel Stone is adamant on attacking even though it will be a "costly" battle: "It's worth the whole regiment." Khan tells his three British prisoners that if the Colonel is captured alive during the skirmish, that they would all die, and then gloats: "I shall have the pleasure of bringing the Colonel face to face with a son who betrayed his Empire." Meanwhile as the Lancers advance forward with bugles and trumpets blowing, the three captive officers plot their escape from their dungeon cell. After exploding the lock (with stolen shells filled with gunpowder), McGregor and Forsythe commandeer a machine gun, open fire and shoot down some of the rebels in the stronghold's inner courtyard. McGregor heroically sprints toward the armory - wounded in the process, and sacrifices himself when he blows up the ammunition supply. As the Lancers break through the outer gates, Donald courageously and single-handedly (to redeem himself) tackles Khan on horseback and stabs him to death in the back. The leaderless natives instantly surrender. In the film's final scene, at the parade ground of the 41st Regiment of the Bengal Lancers, Col. Stone pins a distinguished service medal on Lt. Forsythe. Lt. Stone is proudly honored by his father with another distinguished service medal for his "conspicuous gallantry and devotion to duty - he attacked singlehanded, a group of the enemy and killed their leader thus demoralizing hostile forces at a moment when the success of our arms at Mogala was in the balance." And Stone awards McGregor a posthumous Victoria Cross medal ("For valor - at the sacrifice of his life, he destroyed enemy ammunition supplies, contributing thereby to the success of our arms in the action at Mogala"), pinned to the saddlecloth of McGregor's riderless horse.